"The Aunties provide inspired, loving care and first-class education for pre-school children and babies"
. It is remarkable to hear the stories told by the nursery staff (Aunties) about how much the organisation has helped them, not only in their work, but also in their personal lives. It is true to say that the organisation ‘goes the extra mile’ for all employees. There is a genuine commitment to learning and development, which employees really appreciate. Staff are very complimentary about the support they receive from the Aunties. The delivery of the learning and development programme is considered robust, as well as meeting the needs of employees, both in terms of the standards and methods of care for the children and in skills development and ongoing personal growth of employees at all levels. "Loyalty and pride in the work shines through. The Assessor witnessed this first-hand by observing discussions between the owners and the staff and during development and improvement sessions. There is a culture of loyalty operating across the Aunties, both towards the owners and the parents and, most importantly, towards the development and the welfare of the children at the nursery. A diverse workforce is in place as well as an environment supporting equality and diversity, in terms of access to development and learning and personal growth, throughout the organisation. The efforts made to gather information in terms of children’s achievements, parent feedback and the performance of the children is well established and much more innovative than in other nurseries. On-the-job observation and supervision is strong.....which enables managers and deputies to see how learning is implemented in departments, for example, outside activities, mealtimes, nappy changing and room observation. In addition, managers are very visible throughout the organisation, whereby they can observe for themselves the standards delivered by the workforce. Work with Ofsted and other external bodies to do more to recognise the benefits of having a people culture operating throughout organisations of this kind and the benefits that this can bring. The priorities for learning and development are geared first and foremost towards ensuring that all staff are trained to a high standard and continuously develop themselves to be able to provide first-rate care and attention towards the development of the children. The development of the children is very much based on outdoor activity.....to enhance the children’s connection with people and nature – making them aware of their place in and responsibility to the fabric of life, and there are outdoor and forest-trained Aunties working in the nursery. 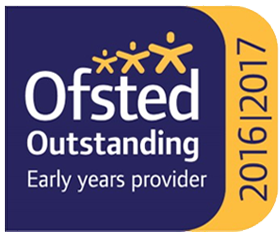 All staff are very clear on their roles, in terms of standards and the quality of work required to look after the children. There is a great feeling of teamwork across both sites, with staff being flexible and doing what needs to be done. There is no sense of ‘it’s not my job’, and what is very evident is that the children ‘always come first’. The attention to detail and efforts put into the welfare and development of the children is very impressive, and support is delivered in a caring and loving way. People are very positive about the style of leadership and management shown by the owners and the managers of the nursery across both sites. Undoubtedly, the owners and managers recognise their responsibilities in terms of effective leadership and management....undergoing training and development in advance of and alongside junior colleagues, and in living the values of the nursery in their day-to-day interaction with Aunties and the children at all levels. The same style of leadership is undertaken when dealing with stakeholders, and managers are very visible throughout the nursery. Staff described a very positive sense of management style with a lot of positive comments about the managers. Individuals described managers using coaching and mentoring skills to help them develop their potential, review work and continuously improve practice and procedures when dealing with the children and the Aunties. Everybody confirmed that they respected and trusted their managers at all levels. Everybody had confidence in the owners’ leadership and management capabilities as individuals to face future challenges and changes". The staff are very committed to the children in terms of the highest standards of care and development, and, in turn, are also committed to the owners of the organisation. Valuing people at this organisation appears to work both ways. Staff feel that the organisation ‘goes the extra mile’ for them and, in turn, they will ‘go the extra mile’ for the organisation. The method of valuing and appreciating is very much part of the culture and its values, i.e. caring, living and loyalty; again demonstrating that the values are alive and well embedded within the organisation. People expressed a real pride in their work and in that of their colleagues. They believed, in particular, that the job they were doing was making a difference to the children, thereby ensuring they met all expectations. What is very noticeable are the efforts put into learning together and putting the learning into practice straightaway. There is consistency in terms of leadership and management styles, as well as a great diversity of ideas and skills operating at the top of the organisation, which is working very well towards delivering the vision, mission and values. Having carried out the assessment process in accordance with the guidelines provided for Assessors by Investors in People – United Kingdom Commission for Employment and Skills, the Assessor is totally satisfied that the Aunties’ Old School Nursery meets the requirements of the IiP National Standard at the Core Level and, in addition, has reached Gold status.